Want to Try Everything Before You Buy? 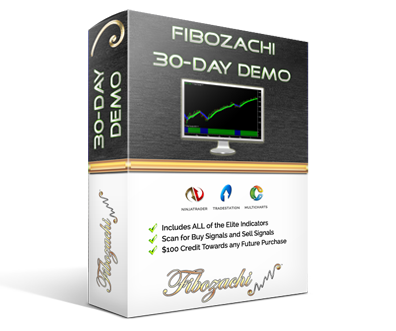 The Fibozachi 30-Day Demo lets you use all of our trading indicators for a full month, making it the ideal choice if you can't decide between our various Indicator Packages — or just want to take everything for a test drive. You'll have access to more than 80 proprietary indicators that cover each and every aspect of trading — including volume analysis, volatility signals, trend strength, and so much more. The total value of these Indicator Packages is well over $5,000, so this is your chance to try everything at a fraction of the cost! And most importantly, the entire cost of your demo will be applied towards whatever Indicator Packages you decide to keep — plus an extra 10% off! Receive a $1,000 Credit & Save an Extra 10%! Receive a $1,000 credit to apply towards the purchase of any Indicator Packages (more than the actual cost of the demo!). This guarantees that you'll get the Indicators you like best after trying everything else for free! You'll also get an additional 10% off coupon! Not only will you get to try all Fibozachi Indicators at a fraction of the price, but you'll also be saving money in the process! Upgrade your trading arsenal with everything you need! More than 80 of our proprietary Trading Indicators to cover each and every aspect of trading - including volume analysis, candlestick patterns, volatility signals, and much more! You won't waste any time wondering "what chart to look at" or how to set-up a template! We include 3 different workspaces / templates with every Indicator Package so that the only choice you have to make is whether you want a black, white, or silver background. You'll also get special, pre-configured "Scanner" workspaces and templates. This means that you can immediately scan for signals and trend conditions across any Indicator. Because scanning unlocks the full potential of many Indicators, we've done all the setup so that you can start immediately. Have a question about the Fibozachi 30-Day Demo?